Multiple buyers confirmed for huge Leicestershire construction supply chain event. REGISTER NOW! If you are a contractor/supplier of construction trades located within Leicestershire region this is the event for you! 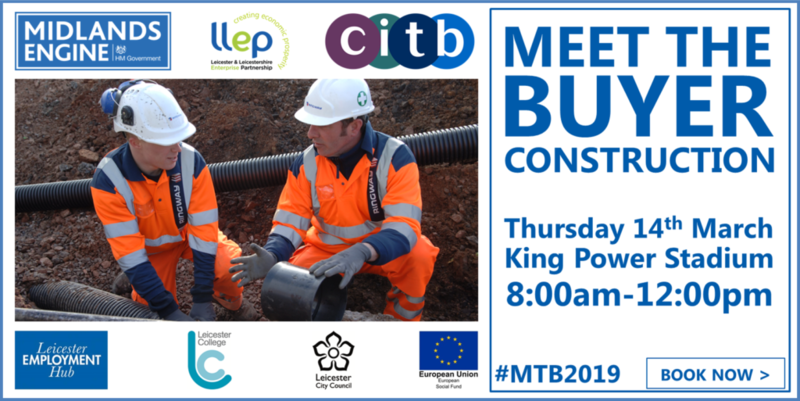 The Leicester Leicestershire Enterprise Partnership (LLEP), Leicester City Council and CITB are hosting a Meet the Buyer Event at the King Power Football Stadium – home of the Leicester City Football team. This event has been organised for local suppliers to meet with the leading construction companies working across the region. This is a one-off opportunity to meet with the supply chain managers who are genuine buyers and have work available! The above listed buyers all have a requirement for Leicestershire construction contractors that are in a position to deliver a variety of packages in and around the East Midlands region over the next 18 months. So if you represent a Leicestershire contractor please attend and start conversations that could put your business in a prime position to win work! Also at the event will be representatives from a number of business support, skills support and accreditation and procurement support organisations that will be on hand to provide advice. You will also have an opportunity to discuss funding support to help your business to grow. Our support partners include; Constructionline, National Federation of Builders, CITB, LLEP Growth Hub, Builders Talk, Leicester Employment Hub and the local FE Colleges. Complimentary breakfast will be provided for all attendees.